Dental Implants provide a permanent solution for replacing missing or removed teeth. They are among the most successful dental treatment options available and are considered the highest standard of tooth replacement. Sandstone Dental offers dental implants to patients looking to replace a single tooth, several teeth or all of your teeth. 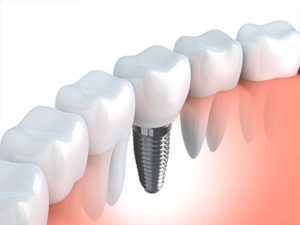 The implant consists of a small, sturdy metal post that anchors the tooth and is capped with a dental crown. Dental implants look, feel and function like your natural teeth, enabling you to smile, speak and eat with confidence. Long lasting. With proper upkeep, dental implants can last a lifetime. You’ll still need to see your dentist regularly for the periodic adjustments. This means you will enjoy a long return on your investment. Gives you peace of mind. Now you no longer need to cover your mouth when you laugh or smile. You won’t have to worry about dental appliances in your mouth loosening or falling off. With dental implants, you can enjoy life as you would with real teeth. Lets you maintain your natural face shape. When you have missing teeth, your face can start to appear sunken. With dental implants as your artificial teeth replacement, you can bring back the natural shape of your face and maintain it for the long-term. It’s not just your smile that is improved, your face will appear healthier and more attractive. Helps you prevent cavities. Did you know that dental implants are cavity proof? With dental implants, your smile is no longer as vulnerable to tooth decay. However, this doesn’t mean that you can also forego regular dental hygiene habits. You still need to care for your replacement teeth the way you do for your natural teeth to avoid gum disease and other related problems. Keeps your jawbones strong. Your tooth roots help keep your jawbones firm and strong. When you have missing teeth, the jawbone deteriorates and loses its firmness as well. This means that not replacing teeth and leaving the space empty for a long period of time not only affects the appearance of your smile, it can cause other health issues. Holds artificial teeth in place. When dental implants are used to secure a denture, you won’t have to feel conscious about your artificial teeth moving or clicking. You take your mind off your teeth and focus on creating moments instead. No more watching from the sidelines. You can get back in the game and do even better with renewed confidence. Would like to know more about dental implants? Please feel free to contact us. Let’s find the best dental solution for your needs.